IMCDb.org: Atkinson T746 in "Ferry Load, 1960"
Looks very like an Atkinson to me. I agree the radiator is typically Atkinson. It also looks to have the offset 'Silver Knight' badge. However the cab is unlike any Atkinson cab I can find. Possibly a more 'modern' cab specified by Whitbread beers (the owner of this tanker) and the reason the circled 'A' was removed also. 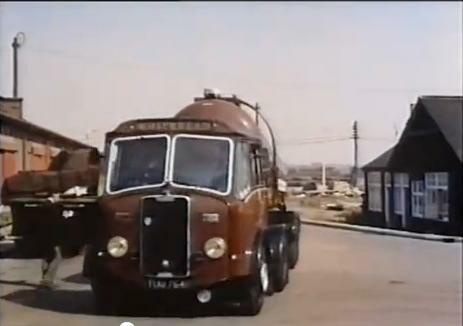 The beer tankers were used equally for advertising as well as distribution and their appearance was important to the brewery. This isn't a Silver Knight - that was a tractor unit from 1964 onwards. This is a tractor (quite possibly with an AEC engine, as Whitbread operated a number to that spec) probably a T746, fitted with a Kenning cab. An ex-Whitbead 8-legger with the same cab has survived into preservation.